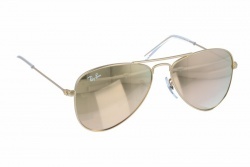 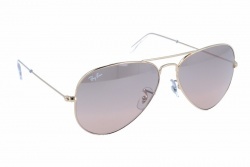 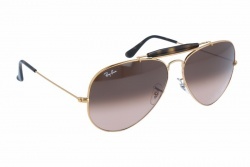 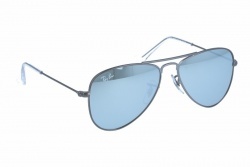 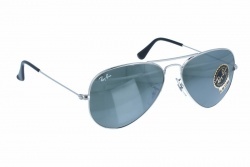 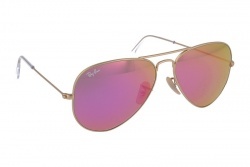 Ray-Ban Aviator collection includes the different evolutions of this model that have been adding more or less subtle variations to this iconic aviator shaped sunglasses. 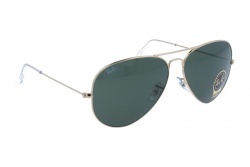 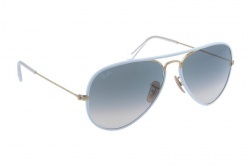 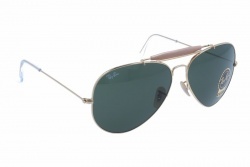 The aviator shape was originally designed in 1936 for the US army, especially for pilots. 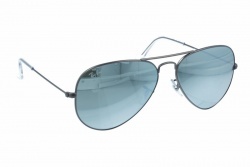 It featured lenses in aviator tear drop shape to protect pilots’ eyes from glare and who found peaked caps really uncomfortable. 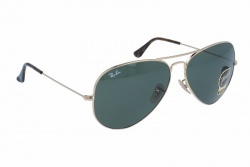 Later, Ray-Ban Aviator sunglasses were incorporated to the US army gear during the Second World War and since 1937, they were sold to everybody. 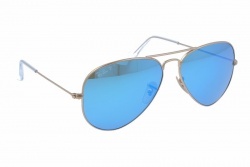 During that decade, a new innovation was incorporated to those lenses: Gradient Silver Mirror, a gradient mirrored coating that protected eyes from sun rays at the top part of the lens and it also offered clear vision at the front, getting us ready to face different light conditions and exposure to sun, and making them quite comfortable for driving, among other activities. 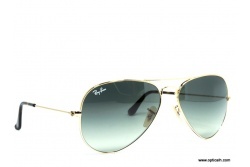 Thanks to their legendary and bold designs, Ray-Ban has made a difference over the years and nowadays it’s become the top modern sunglass manufacturer and it’s widely the most imitated. 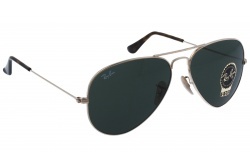 The original Aviator Classic model (model 3025) was characterised by its classic and simple gold frame and tear drop shaped green lenses. 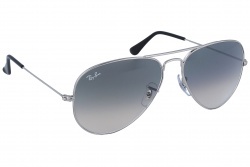 Within this design line, we find relevant models such as RB3025 Large Metal and RB3026 large Metal II, as well as different variations of Wings model. 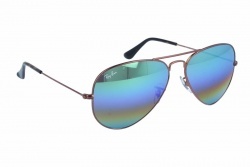 Aviator Flash Lenses collection presents innovations from model 3025 with mirrored lenses made in cheerful colours (violet, orange, green, blue…) or the always chic gold, and Aviator Gradient series introduces gradient lenses in flashy colours, with new beige temples and temple tips. Aviator Polar Special Series combines classic tear drop shaped lenses and gold frame with polarized lenses in very fresh and appealing colours, such as sky blue, orange or pink. 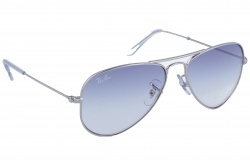 A further revision of the original model is what we find in model Aviator 3449, with semi rimless frame, with metallic rives decoration in arrow shape, with light and highly resistant temples that give the frame a sports style. Metallic temples with flat edges with plastic ends are one of the distinctive features of this update. It’s available with green and brown lenses. 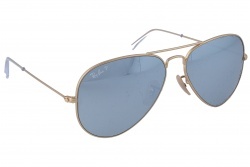 And yet another reinterpretation of 3025 model originated Aviator Flat Metal (3513), made of laser cut metal, what ensures extreme precision, unprecedented lightness and very modern finish. 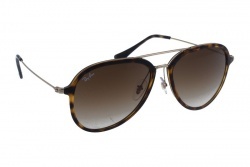 The latest version is fitted with lenses with acetate cover edges, and is available in grey and brown. 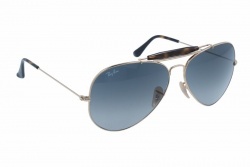 Slightly separate from original 3025 shape but preserving aviator style, there are other models, such as Cats, with acetate aviator frame, or model 3509, a softer aviator shaped frame with thick temples as its more outstanding trait. And for those who are passionate about the classy, tradition joins the most cutting-edge technology to present model 8313, made of carbon fibre, what provides these glasses with an extraordinary resistance and great lightness and comfort at the same time. 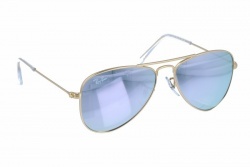 And of course, for little kids who want to be trendy, there’s the Ray-Ban Aviator Junior edition, with different colour combination and even mirror lenses. 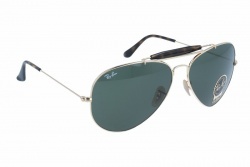 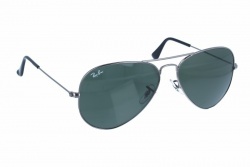 Currently we can find an aviator design not only in Ray-Ban sunglass collection but also as part of their optical line, with a different reference number: RX 6049. 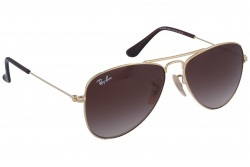 If you love these iconic sunglasses, now you can get the same design for your prescription glasses.